A few weeks ago, Molly at My Name Is Yeh was giving away a gorgeous wooden cake stand. For an entry, you had to comment with what you would display on the cake stand, were you to win. I said I would like to develop a recipe for a cake version of my beloved triple-ginger cookies which are, in turn, based slightly on Ina Garten's version. My entry never went through and since I wasn't likely to win that way, I decided to develop the recipe anyway. Thanks, Molly, for spurring me onward into uncommon inspiration! I made that cake. Successfully. 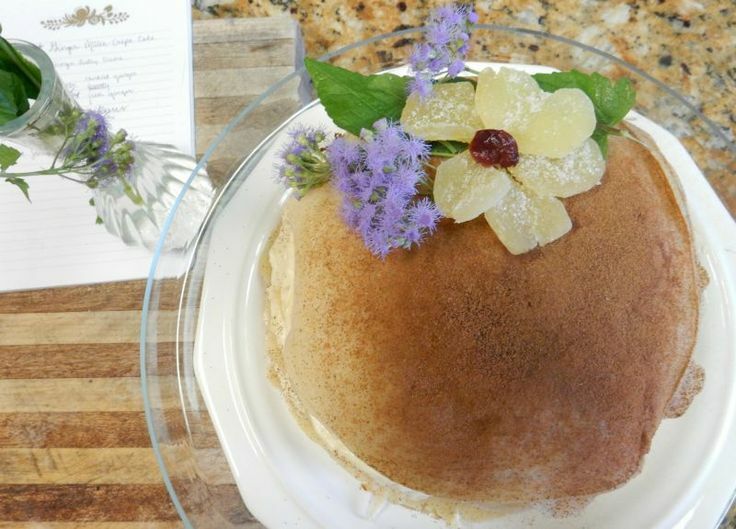 And not just any cake...a crepe cake! 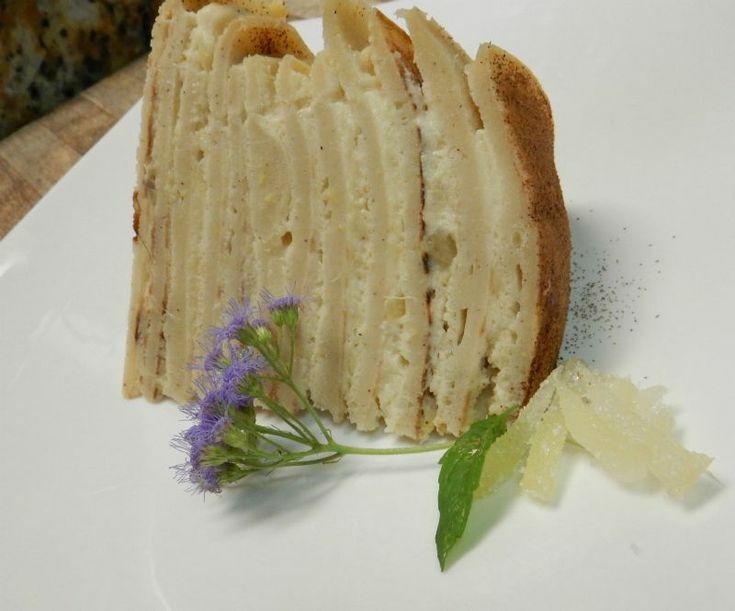 The byproduct of this sudden inspiration is Triple Ginger Mille Crepe Cake. This cake is basically pancake-ception....a cake made out of gently spiced pancakes with layers of punch-packing ginger pastry-cream. If you are looking for the all the satisfaction of an unapologetically pugnacious gingersnap without actually making a batch of gingersnaps, then this cake is for you. It looks like the sister of Jabba the Hut optimistically clad in shapewear, but man alive is it good. The recipe follows the glamour-shoot. 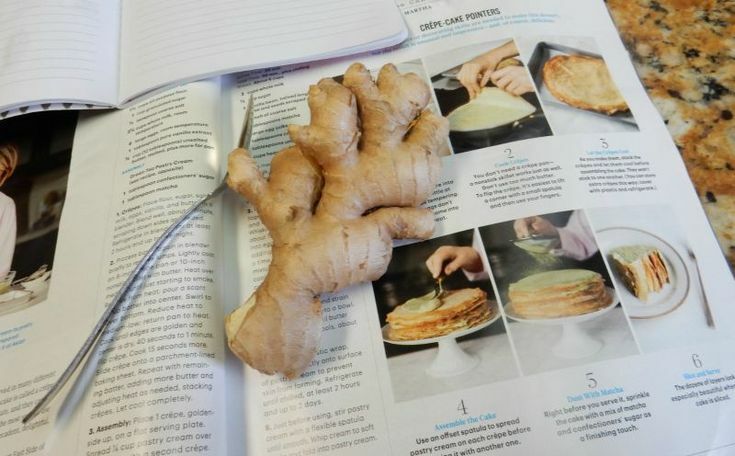 An easy way to peel ginger is to scrape it with the bowl of a spoon! Active time: 1 hr. 10 min. 1.) 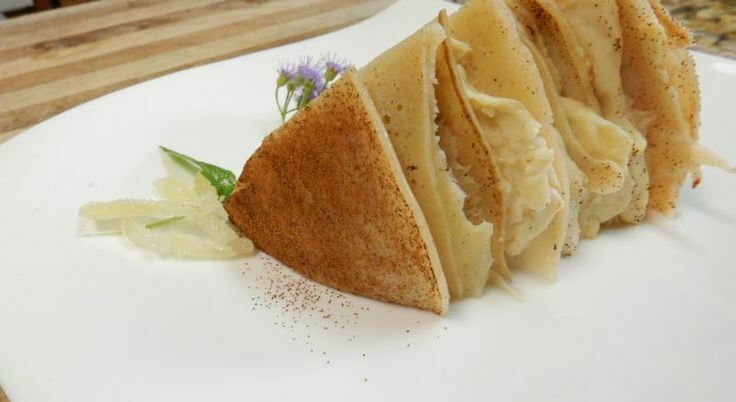 For Crepes: Place flour, sugar, salt, milk, eggs, vanilla, ginger, other spices, and butter in blender. Blend well for a minute or so. Scrape down sides as needed, then cover and chill in the refrigerator at least two hours or overnight. While chilling, make pastry cream (recipe below). 2.) Process batter again (briefly) to remove lumps. Lightly coat a small skillet with butter. If possible, use a non-stick skillet coated with butter. My crepes would have turned out thinner if I had had access to one. Heat over medium heat until butter begins to smoke. Pour 1/4 cup of batter into center of pan and swirl to cover. Reduce heat to medium-low and return pan to heat. Cook till edges are golden and center is firm, about a minute. 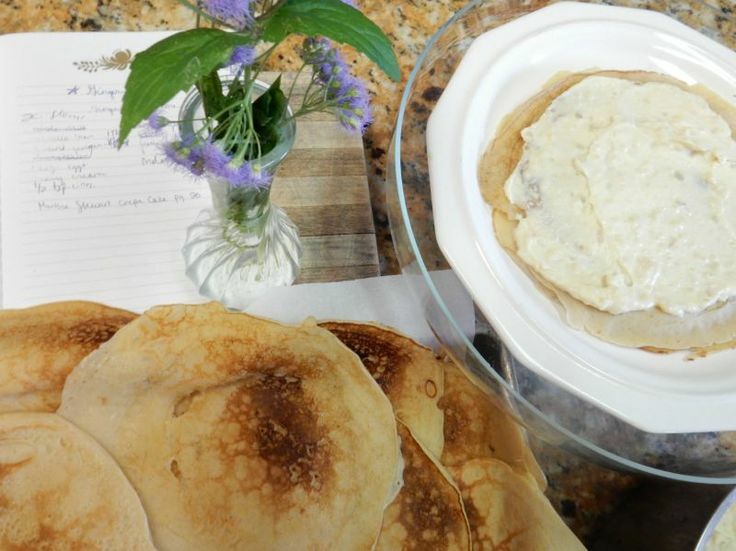 Lift and flip crepe either with a large spatula or your fingers. If using fingers, be careful - it can hurt rather badly. Cook 15 seconds more, then transfer to a cookie sheet lined with parchment paper. Feel free to stack the crepes as they come off the heat - they will not stick to each other. 3.) For Cream: In medium saucepan, combine milk, 1/4 cup of sugar, molasses, the salt, and fresh ginger slices. Cook over medium-high heat until mixture comes to a simmer. Fish out ginger slices. 4.) In a medium bowl, whisk together egg yolks, cornstarch, and remaining 1/4 cup of sugar. Whisking constantly, slowing pour about 1/2 cup of the hot mixture into the egg yolk mixture. Continue adding the hot stuff to the egg yolks, whisking until incorporated. Return to the saucepan and cook over medium heat, whisking constantly, until it thickens and comes to a boil. Let boil, still whisking, two minutes. 5.) Remove from heat and, straining out any lumps, add vanilla and minced candied ginger. Add butter and stir until butter melts and mixture cools, about 5 minutes. Cover with plastic wrap pressed directly onto the surface of the cream to prevent a "skin" from forming. Chill until cool, at least 2 hours and up to two days. 6.) 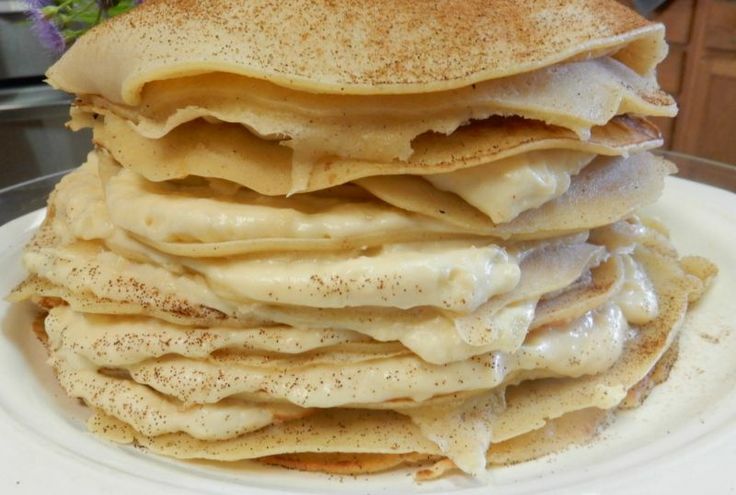 Assembly: Assemble your cake by alternating layers of crepe and cream. Sift a half-teaspoon of cinnamon overtop of the cake and decorate as you wish! "It looks like the sister of Jabba the Hut optimistically clad in shapewear." Thou art making me hungry, my lady Rachel. If you're a fan of ginger, it is lovvvvvely.